The Art Bulletin publishes leading scholarship in the English language in all aspects of art history as practiced in the academy, museums, and other institutions. From its founding in 1913, the journal has published, through rigorous peer review, scholarly articles and critical reviews of the highest quality in all areas and periods of the history of art. Articles take a variety of methodological approaches, from the historical to the theoretical. In its mission as a journal of record, The Art Bulletin fosters an intensive engagement with intellectual developments and debates in contemporary art-historical practice. It is published four times a year: in March, June, September, and December. The Art Bulletin is published in print and online and is available as a benefit of membership in CAA. When I entered the Department of Art History and Theory at the Central Academy of Fine Arts in Beijing in 1989, art history and theory were the farthest things from the minds of many artists. In fact, for the generation who survived the Cultural Revolution, history and theory were rather suspect concepts, tainted by ideology. During the Cultural Revolution, students had not been allowed to study even the Chinese tradition of art historical writings dating back centuries, considered a legacy of the past feudal society. Modern Western art history and theory, introduced with the reform policy in China, have been particularly popular among the younger generation since the 1980s.4 As a recent discipline with its foundations not yet established, art history carries the joy and excitement of exploring the new. The works of Alois Riegl, Heinrich Wolfﬂin, E. H. Gombrich, and Erwin Panofsky have been translated into Chinese since the late 1980s and added as part of the curriculum. In the following years, a wider range of texts became available in Chinese, including those by Michael Baxandall, Arnold Hauser, T. J. Clark, Meyer Schapiro, Leo Steinberg, and Hans Belting.5 These translations and studies have helped transform and restructure the entire discipline of art history and theory in China. Not only has the discipline been greatly expanded, it has also in turn become accessible to scholars throughout Chinese art studies. For instance, iconography has become one of the most widely employed methodological approaches for studying Chinese Buddhist art and traditional Chinese painting. revision of practices in the humanities. This new development certainly raised more questions for the newly established discipline, such as: If “the new art history” or “visual culture studies” have applied critical methods to its own practices in the West,15 can it aid in reﬁning the methodology of other cultures, including Chinese art history? While it is possible to critique the social conditions of the reception of “non-Western art” such as “Chinese art,” how can one critique the “traditional” history of Chinese art if it is not recorded in the same way as European art? China has a long history of scholarship in art, especially in Chinese painting. Evidence of this goes all the way back to the fourth century. 16 One of the earliest recorded writings on art is Xie He’s “Six Principles of Chinese Painting” (Huihua liufa), taken from the preface to his book The Classiﬁcation of Old Paintings (Guhua pinlu), written about 550, pertaining to “ancient” and classic practices. Based on his “six principles,” Xie He believed that artists’ primary objective is to capture the vitality of the subjects as well as to demonstrate their own taste, spirit, and moral sensitivity in the paintings. His theory is more concerned with the criteria for aesthetic evaluation and principles for the painter to cultivate than in giving a canonical description of the past. It was Zhang Yanyuan who initiated the style of writing on art history in China. His “On Famous Paintings in Past Dynasties” (Lidai minghua ji, 847) added the practices of recording, appraising, collecting, circulating, and even mounting as components indispensable to painting and gave rise to the integral research system of Chinese painting history. The book extensively covered the major developments and signiﬁcant theories on the history of painting. The biography section consisted of comprehensive records of painters’ lives, thoughts, and works. Zhang Yanyuan agreed with Xie He’s theory that art has moral functions. He also stressed the importance of imagination and creativity in painting, which he believed very much relied on the artist’s taste, education, knowledge, and personality. Modern art history in China emerged in the early twentieth century, inﬂuenced by the Western model. Teng Gu’s Zhongguo meishu xiaoshi (A brief history of Chinese art, 1926) offered a new theoretical framework for Chinese art, featuring a linear and progressive conception of time. This Darwinist approach is particularly apparent in his periodization of Chinese art. Teng Gu divided the history of Chinese art into four periods related to style transformation: growth (shengzhang shidai, from the emergence of art to the Han dynasty), cross-fertilization (hunjiao shidai, encompassing the Wei, Jin, and the Six Dynasties), the ﬂourishing period (changsheng shidai, from the Sui to the Song), and stagnation (chenzhi shidai, the Yuan, Ming, and Qing dynasties).19 He saw an artistic decline during the later dynasties. Most impressively, Teng Gu considered the cross-fertilization and ﬂourishing periods as producing tremendous innovations in art. During that time Chinese culture was actively integrated with others. The descriptive terminology for the periodization invented by Teng Gu and shared by other Chinese scholars demonstrates their effort to establish a scientiﬁc discipline of Chinese art history, to position Chinese art in parallel with Western art, and to elucidate the comparability of Chinese art to Western art. thinking about art? How is the Chinese way of understanding art commensurate with the concept of art history as it is practiced in the European and North American model? The institutional situation in which art history ﬁnds itself in twenty-ﬁrst-century China, very different from the Western context, is the background against which the argument between art history and visual culture will be played out. The main threat to art history in China may come not from the new methodology of the West but from the economic and ideological agenda dominating decision making in the Chinese system of education. Mitchell’s formulation that “aesthetics is an eighteenth-century discipline, art history a nineteenth-century one, and visual studies that of the twenty-ﬁrst” 20 may well pertain to the European and North American situation, but it certainly cannot apply to the Chinese academic situation. As a rather new practice, art history in China must justify its place culturally within Chinese art institutions and universities. Most of the universities do not have an art history department; instead, they have departments of aesthetics, ﬁne arts, or design with art historians on staff. 21 As an academic discipline, art history has never been taken as seriously as history, literature, or archaeology among the studies of humanities. If a defense of art historical scholarship is called for, it may be imperative only in this cultural situation. Given the rather isolated cultural conditions surrounding the study of art history in China, the “tools” of visual culture should not obscure the initial need to construct the aesthetics and discipline of Chinese art history. This need is particularly acute in relation to the study of Chinese art. The traditional art history model, based on empirical study, is closely harnessed to many of the newly established art galleries and museums and their collections. 22 This is not to say that art history in China should retain its previous form, but it is necessary to protect and defend the disciplines, while at the same time encouraging new interdisciplinary approaches. Just as the contemporary Chinese social economy largely joined the generalized global market, the new method and interpretative protocols for art history have been inevitably pervasive in the current way of writing, thinking, and speaking. If the “global community” of art historians should not consist, in Hayden White’s words, of “congeries of historians from various countries who have adopted the ‘standards of practice’ of Western professional historians,” 23 how could non-Western art historians apply the apparatus of Westernized art history, and, at the same time, make use of the interpretative methodologies from their own past? torical research, but also keep up with contemporary theories and methods, which is perhaps an ideal model for the future of the discipline. Is art history withering? The presumption of the end of the discipline might just be like someone holding a dark mirror to an optimistic future. It seems unlikely to happen under the threat of visual culture on its trajectory toward interdisciplinary or transdisciplinary study, as long as it resists being tied to a single grand narrative. The discipline of art history may have been infected or threatened by excursions across disciplinary boundaries, but art history is also growing from the experience. Perhaps the best way to move forward is to ﬁnd the purpose of art history, which is vital for establishing mutual understanding among all cultures, instead of marginalizing any culture or discourse. art? Thoughts about temporalities and a philosophical base of historical understanding are necessary to help direct the present and open up more possibilities in the future. in the classic text The Classic of Mountains and Seas (Shan haijing). According to legend, the phoenix is only to be seen at the dawn of a period of great harmony. 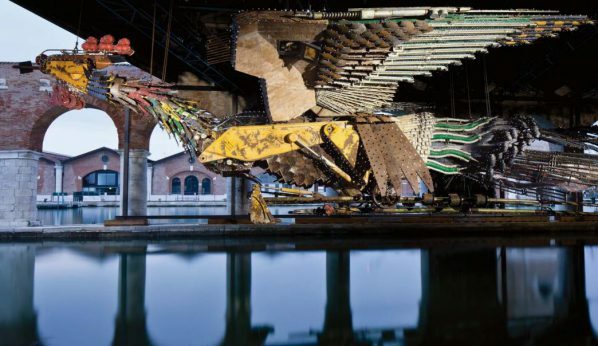 Xu Bing represented the mythical bird of Utopia as an enormous ﬂoating statue composed of the detritus of urban construction. The physical structure made of useless and discarded objects bears people’s Utopian aspirations for a harmonious world. Weaving together the fabric of Chinese traditional myth and contemporary reality, the artist interrogates the nature of present and past, spectacle and materiality, the historical process and global contemporaneity. Shao Yiyang, professor of art history and theory, especially modern and contemporary art and theory, is deputy dean of the School of Humanities at the Central Academy of Fine Arts, Beijing. Her publications in Chinese include Art after Postmodernism, Beyond Postmodernism, and Modern European Art History since the Seventeenth Century [Central Academy of Fine Arts, no. 8 Huajidi South St., Chaoyang District, Beijing, China 100102, shaoyiyang@cafa.edu.cn]. art history studies. Among them, Shao Dazhen, Cheng Yongjiang, and Li Chun taught Western art history in the Department of Art History in the Central Academy of Fine Arts, and Xi Jingzhi played a crucial role in establishing the art history department in the former Central Academy of Craft and Design in 1983. 2. In 1960, a textbook on Western art history produced by the Ministry of Culture came out. It ranged from the premodern period to the end of the nineteenth century. It was formally published in 1984.
art schools and museums throughout the country. They constructed the framework of modern studies on Chinese art authentication. art into Chinese art practice and research. See Shao Dazhen, Xian dai pai mei shu qianyi (Shijiazhuang: Hebei meishu, 1982); and idem, Chuantong meishu yu xiandaipai (Chengdu: Sichuan renmin, 1983). 5. Except for individual books, the translations of essays on Western art history and theory were mainly published in art journals, such as Meishu, Shijie meishu,and Meishu yanjiu in Beijing and Meishu yicong and Xin meishu in Hangzhou. See also Cao Yiqiang, ed., Yishushi de shiye (Hangzhou: Zhongguo meishu xueyuan, 2007), a collection of forty-eight translations of essays on Western art methodology, which were originally published in Xin meishu from 1986 to 2006.
mann and Wolfgang Br€ uckle, Vereinigung der Kunsthistorikerinnen und Kunsthistoriker in der Schweiz (Munich: S. Schreiber, 2008). 7. A. L. Rees and Frances Borzello, eds., The New Art History (London: Camden Press, 1986). 9. W. J. T. Mitchell, “Showing Seeing: A Critique of Visual Culture,” in Art History, Aesthetics, Visual Studies, ed. Michael Ann Holly and Keith Moxey (Williamstown, Mass. : Sterling and Francine Clark Art Institute, 2002), 544–45. 10. Bernard Smith, “In Defence of Art History,” Art Monthly Australia, no. 130 (2000): 6. 11. Mitchell, “Showing Seeing,” 544–45. 12. The art history departments in the Central Academy of Fine Arts and the Hangzhou-based National Academy of Fine Arts were placed within the newly established School of Humanities, including departments of art history, art education, curatorship, and cultural heritage. Academy of Fine Arts. The establishment of the Department of Visual Culture was announced at that time. Chinese), Meishu yanjiu, no. 4 (2009): 102–7. 15. Donald Preziosi, Rethinking Art History (New Haven: Yale University Press, 1989), 19–31. 16. Citations of scholarship on art can be found even before the fourth century. Many of these writings and texts were not well preserved, so few of the actual texts are extant. However, throughout history, many of these writings and texts have been quoted by ancient Chinese scholars, historians, and authors. 17. See Xue Yongnian, “Ershishiji zhonguo meishushi yanjiude huigu yu zhanwang,” Wenyi yanjiu, no. 2 (2001): 112–27. 18. James Elkins, Chinese Landscape Painting as Western Art History (Hong Kong: Hong Kong University Press, 2010), 58. 19. Teng Gu, Zhongguo meishu xiaoshi [ A brief history of Chinese art ] (Shanghai: Commercial Press, 1926). 20. Mitchell, quoted in Holly and Moxey, introduction to Art History, Aesthetics, Visual Studies, ix. 21. There is no art history department in Peking University. The study of art history has been available through the art center, which offers introductory courses and takes only graduate students. The art history department in Tsinghua University belongs not in the School ofHumanities but in the Academy of Arts and Design, which was the former Central Academy of Crafts. 22. For the development of new museums, see Clare Jacobson, New Museums in China (New York: Princeton Architectural Press, 2013). 23. Hayden White, “The Westernization of World History,” in Western Historical Thinking: An Intercultural Debate, ed.Jorn Rusen (New York: Berghahn Books, 2002), 112. 24. Okwui Enwezor, “All the World’s Futures,” La Biennale, Art, 56th Exhibition, http://www.labiennale.org/en/art/exhibition/enwezor/.